Brilliant new product to push the small-bore units to their limit. 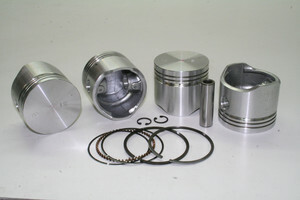 Flat top pistons, set of 4 complete with rings and pins at +0.135”! That gives a capacity of 1218cc. Manufactured from a far superior aluminium than most high performance pistons, it contains a much higher silicon content, Using advanced heat treatments, a more heat-stable piston is created. This dramatically reduces expansion under combustion/running conditions. Consequently lower piston to bore clearances are required maximising piston stability in the bore and therefore better piston ring sealing.